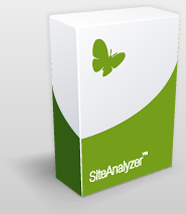 The Qualidator® website Analyzer is a Windows application, developed to allow a one step, page by page, automated validation of an entire web project (HTML & CSS), and to review the quality by carrying out over 30 additional tests. At the same time, a link check is also carried out. Price and Editions – Basis version is free! 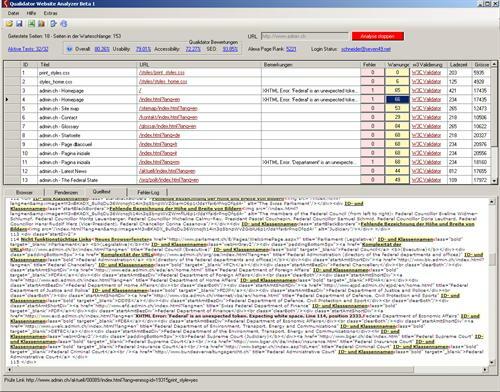 Weak spots are listed colour-coded by single pages (URL) and amount of weak spots identified. At the same time, the size and download time of every single page is calculated. 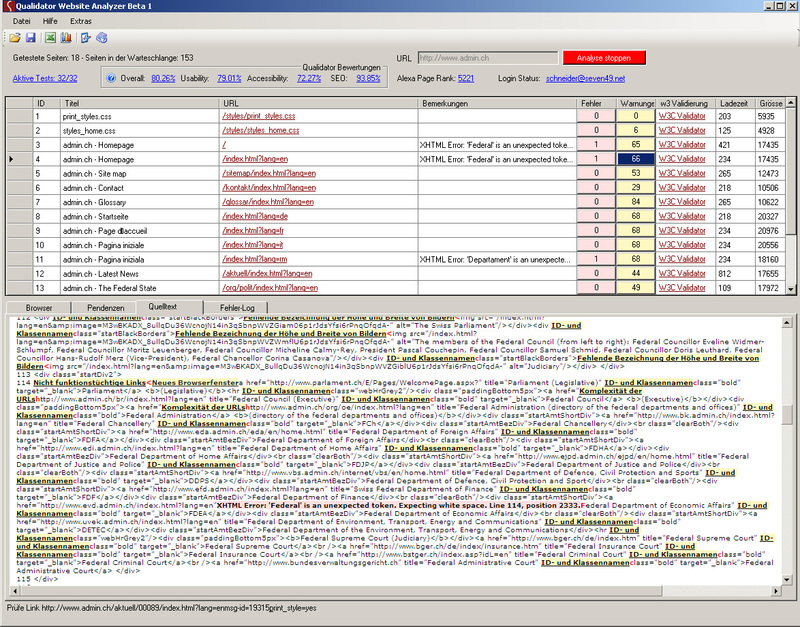 The tested pages can be displayed in a choice of three ways: browser mode with direct page preview, report mode with a list and a summary of the weak spots identified, or code mode with the identified weak spots highlighted in colour. Tests can be switched on and off, and they allow to prioritise and to focus on specific aspects of a website quality assurance. The test settings are individually configured and are preserved when the programme is switched off. At the same time, the ranking of Qualidator and the Alexa Pagerank of the web project are determined at the start of the test. The detailed report function allows a constant overview of the still existing weak spots. All test results can be exported or saved for use at a later time. Numerous options are available. The applied tests can be controlled by the user at any time. There are two cost free editions and three licensed versions. A complete overview of the editions can be found on the Editions overview page. The basic version, with or without registration, is available for free. For the coverage of the licensed services, please read our overview.